One of Britain's top trauma experts has told the Damilola Taylor murder trial he thought the 10-year-old died after falling on a shard of glass. Alastair Wilson, the associate clinical director at the Royal London Hospital, said the fatal injury was not consistent with a stabbing. 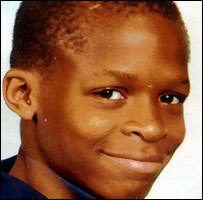 Damilola, from Peckham, south London, died of blood loss on 27 November 2000. Two brothers, aged 17 and 18, who cannot be named for legal reasons, deny murder along with Hassan Jihad, 20. The defendants were aged between 12 and 14 at the time of Damilola's death. Orlando Pownall QC, defending the younger boy, has already told the jury that his client was not in Blakes Road on the afternoon that Damilola was fatally wounded. But on Tuesday he called Mr Wilson as a witness to dispute the findings of the Home Office pathologist Dr Vesna Djurovic, who said the injury had been caused by Damilola being stabbed with a broken bottle. The broken bottle was found in the street in Blakes Road, 20 yards from the stairwell where Damilola was found bleeding to death, a major artery in the leg having ruptured. He is thought to have collapsed there after running for help. But Mr Wilson said he had spent weeks examining the findings of the post mortem examination and assessing how the injury might have been caused. He said: "I was alarmed when I saw what was in front of me because plainly this was not something I could believe was a deliberate injury." The jury was shown a series of graphics and reconstructions in which Mr Wilson sought to recreate the injury which Damilola had suffered. Mr Wilson said it was possible that Damilola fell onto the shard of glass after being pushed by someone else. Victor Temple QC, for the prosecution, cross examined Mr Wilson and claimed he "had not done his homework". He said he had not visited Blakes Road or seen the cut in Damilola's trousers or the broken bottle itself. Mr Wilson said that was true, but he said he had asked the police and been refused. Later, a former police constable who worked on the original inquiry, Karen Crooks, was called to testify about an interview she conducted with two young girls on 30 November 2000. The girls said a schoolfriend had given them an account of Damilola's death. In it, she said Damilola had been stabbed with a knife by a boy called "Young Mather" whose mother later disposed of the knife and sent him off to the Caribbean. The police have been unable to identify the boy, the court heard.